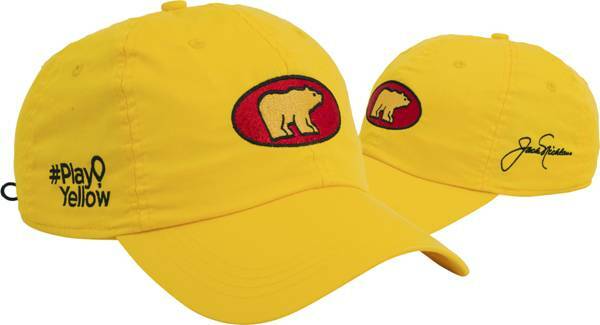 New Bedford, MA — AHEAD, the golf industry’s leader in headwear, and longtime partner the Nicklaus Companies today announced a limited edition Play Yellow hat to support Jack and Barbara Nicklaus’s efforts helping pediatric care nationwide through the work of Children’s Miracle Network Hospitals. Inspired by Jack and Barbara’s passion to improve healthcare for children, AHEAD and the Nicklaus Companies collaborated in creating a special yellow hat featuring the iconic Golden Bear logo and the new Play Yellow logo that Jack Nicklaus will debut at The Masters this week. The hat will be available on Aheadusashop.com; every purchase will benefit the Children’s Miracle Network Hospitals with a direct financial contribution. Last month, Jack and Barbara Nicklaus, founders of the Nicklaus Children’s Health Care Foundation, joined PGA Tour Commissioner Jay Monahan to launch the new Play Yellow campaign supporting the 170 Children’s Miracle Network Hospitals across the country with the goal to raise $100 million. The inspiration for Play Yellow stems from the yellow shirts Jack often wore in the final round of tournaments in honor of Craig Smith, the son of a close Ohio family friend who was battling a rare bone cancer. Craig passed away in 1971 at the age of 13. Fifteen years later, on the morning of the 1986 Masters, Jack, at age 46, once again wore a yellow shirt, playing one of golf history’s most iconic rounds and winning his record sixth Green Jacket. Barbara and Jack have a long history and close ties to a number of CMN Hospitals, most notably Nationwide Children’s Hospital in their hometown of Columbus, Ohio, and Nicklaus Children’s Hospital in Miami. The Memorial Tournament presented by Nationwide has benefited Nationwide Children’s Hospital since its inception in 1976, and it was The Honda Classic’s move to Palm Beach County and down the street from the Nicklauses’ North Palm Beach, Fla., home that inspired Barbara and Jack to create the Nicklaus Children’s Health Care Foundation in 2004. In the 14-plus years since, the Foundation has raised over $100 million, and their support of pediatric programs in South Florida led renowned Miami Children’s Hospital to rebrand to Nicklaus Children’s Hospital. Several years later, the entire Miami Children’s Health System was renamed Nicklaus Children’s Health System. There are now 14 Nicklaus Children’s Outpatient Centers spread throughout the state. The NCHCF has become the primary beneficiary of The Honda Classic. Nationwide Insurance is a proud supporter of Play Yellow, which will also have special activation in Columbus during Memorial Tournament week, May 30 – June 2. Founded in 1995, AHEAD is a multi-dimensional brand with a proven track record of success distributing headwear, apparel, and accessories to the green grass, resort and corporate markets. Its single focus of providing quality products, with innovative, high-quality design, and merchandising concepts has led to more than 20 years of continued growth and expansion. AHEAD has forged many key partnerships in the golf industry, including the USGA, PGA of America, PGA Tour, the Nicklaus Companies, Arnold Palmer Enterprises, and ANNIKA Foundation in addition to more than 5,000 green grass and resort shops throughout the world. Golf legends Jack Nicklaus and Annika Sorenstam wear AHEAD exclusively.